Background In the early Edo Era (around 1600), Suonokami Amano, a clansman from the Owari region, made the Jikin by selecting and mutating a Ryukin-type goldfish which had a long, standing tail fin, stabilizing it as a type of goldfish. 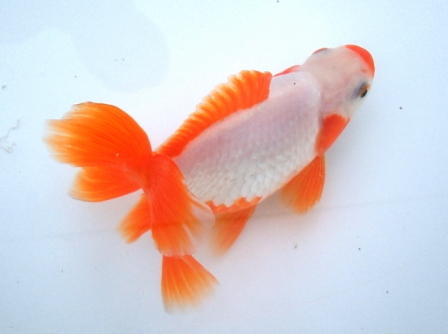 Since then, it has been reared in the Nagoya region as a local goldfish. In 1958, it was registered as a protected species in Aichi Prefecture. The Jikin has the same body shape as the Ryukin. Its characteristics include its peacock tail that looks like an ‘X’ when viewed from behind, and another unique feature is its ‘Rokurin’ (six scales) body color. ‘Rokurin’ means that six parts of its body, the lips and each tail, are red, while the other parts are white. However, since this body color is difficult to achieve, it is artificially adjusted before the Jikin’s body color changes. There are two ways to remove pigment: by removing their scales with a spatula or by applying plum vinegar. This unique tail is associated with the Shachihoko in Nagoya castle (a dolphin statue). The Jikin is also known as ‘peacock’, ‘sea wolf’ and ‘Rokurin’. Acquisition difficulties Difficult. The Jikin is very rare as it is a registered protected species, and is hardly distributed to the public. Acquisition is extremely hard. Rearing difficulties Difficult. The Jikin is the only Wakin-type goldfish that is said to be difficult to rear. The Jikin in the photo is a top-class goldfish that received the king fish award in the two-year-old goldfish division at the Four-Tailed Jikin Preservation Society (owned by Takehiko Tomita). Jikin which did not have color adjustments when they were young will be red and white in body color.